Doing it the hard way! SpaceMonkey is looking for walking buddies! A very interesting and worthwhile climb up Putauaki today, although I made it a lot harder on myself than it needed to be! I headed off at about 12:30 and grabbed the requisite permit from MIL before driving up to the carpark at the bottom of the track up the front of the mountain. I'd considered walking round the base of the mountain to ascend the 4wd service road and the back and traverse the mountain, but a 5km walk up a forest road shared with logging trucks didn't really appeal. As it turned out it would have been quite a bit easier than my eventual route! I headed up the front track which follows the route taken by the runners in the annual King of the Mountain race which had been held the previous weekend. After about half a km of steady climbing the track reaches the top of the mountain's foothills and intersects with an old logging road, before heading up the front face of the mountain. It was at this point that I decided to deviate from plans a bit. Remembering a mountain biking trail some 16-17 years ago that had followed this road, I decided to follow it's route which headed south and over the saddle between Putauaki and the foothills to it's south, meting up with an old logging track not far from the base of the service road, so that I could traverse the mountain as originally planned. It started off pretty well, but once I started to head up towards the saddle proper, it became apparent that the original track had completely overgrown, leaving me to follow nothing but wild pig trails! luckily although the bush was thick, the navigation was easy and after 45 minutes of cursing and bush bashing I emerged onto the old logging road as planned. However here's where my problems really started- upon striking out along this road I heard chainsaws up ahead, and realised that the section of forest I'd planned to walk through was currently being logged! Obviously I couldn't walk that way, so I decided to follow a marked trail that I'd spotted coming out of the bush near where I'd emerged. This turned out to be a possum baiting line, and led high up onto the southern flank of Putauaki. Not really knowing where the track was heading, I kept following it first up, then across to the eastern side of the mountain, hoping I'd eventually emerge either on the summit or somewhere else that I at least knew! Finally about 3 hours after I'd started walking, the bait line emerged onto the 4wd trail up the rear of the mountain at 380m elevation. Had I just walked down the road and started my climb from the bottom of the trail I'd have been here almost two hours ago! Still as it was only just past 4pm and there was still 3+ hours of daylight left, I headed on up. The back of the mountain is covered in virgin bush, but as you get higher and the track traverses back south around the mountain, looking back gives you a great view out over the Rangitaiki Plains to the coast and the islands of the Bay of Plenty. I made the summit plateau pretty quickly and got a great view south toward the Ureweras. Not long after reaching the summit area, a side road branches off to the right to the mountain's true summit. This follows the rim of the mountain's deep, bush filled crater before a set of steps leads up to the forested summit area. Up here there are 3 radio masts, a fire lookout and the summit trig. The views from the trig are stunning, particularly to the north, east and south. Whale Island, White Island, East Cape, the Urewera Ranges, Tarawera, Tauhara, Ruapehu, and Maungawhakamana and Makatiti Dome are all visible from here. The summit itself is a surprisingly sharp little ridge, and the only really vertigo inducing spot on the mountain. After taking a break at the summit I headed back down to the main track and on along the summit road, taking the short diversion to the left to check out the small crater lake in the smaller of Putauaki's two craters. Then along the track a little further to the road's terminus at the large TV mast on the northwest o the summit area. 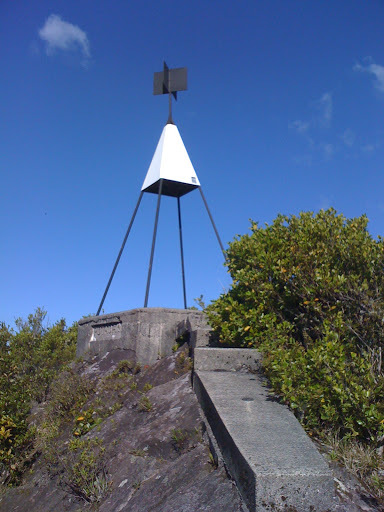 Near the mast is a grassy area which provides brilliant views over Kawerau to the west and northwest, all the way out past Mt Maunganui to the Coromandel ranges, with Otanewainuku, Mayor Island, Motiti Island and the Mount all visible. But it was pushing 6pm by now so I decided to head for home. Taking the foot track into the bush opposite the service buildings for the TV mast, I headed up to the (lower) southwest summit of the mountain, and picked up the top of the mountain's front track and headed down. Given that this track's main use is as a race route, it doesn't bother with switchbacks or traverses and just heads straight down the mountain's western face, and is pretty steep when you're on tired legs! In contrast to the bush-clad eastern and southern sides, the western and northwestern sides of Putauaki are mainly bracken and manuka with a few larger tree ferns, before giving way to pine forest near the base. However the open terrain means you get a great view for most of the descent, which was very nice in the evening sunlight. I finally got back to the car at 7:15, some 6 hours after I'd started what I'd planned to be a 3 hour excursion! Still it was a great days waking/scrambling/bush bashing and I'd reccomend Putauaki to anyone- just take a more direct route than I did! (I reckon the best way would be to take two cars and leave one at each carpark, then traverse the mountain from either side). vinodrinker is looking for walking buddies! Re: Doing it the hard way! Gotta do this this summer. Space Monkey, could you expand on your getting to your starting point - where exactly it is? Sounds a better option than previous reports ive read which start up the logging road! Sure. Basically you head into the forest from Waterhouse St in Kawerau, over the hill through the cutting, turn left then left again, and head about 500m along Tarawera Road with the mountain on your right. Keep a lookout for a small unsealed parking area with a Nga Maunga Kaitiaki Trust sign, park here and you'll see a track leading into the bush, this is the track up the front of the mountain. The start of the 4WD road up the back of the mountain is 5km further along the same road, and is marked by the same sign. I reckon it's worth going up one way and down the other, as the front and back of the mountain are completely different.